I’ve been talking about Ferguson for the past week or so, and it’s left me feeling raw and frustrated and powerless. That’s a good time to take action. This isn’t directly related to Ferguson, but I think it is a good way you can help the general problem of racial disparity we see at work in Ferguson. Minnesota is one of the top states in the country for education. We’re also one of the worst states in the nation for the achievement gap. What’s that mean? It means the performance gap between white students and students of color in Minnesota is among the worst in the nation. So to put it bluntly—Minnesota has a great education system, but only if you’re white. If you’re a student of color, you’re not going to do as well. Now those are older numbers (2004-2006) and the state is making a concerted effort to improve. But a recent report noted that both Minneapolis and St. Paul are only hitting state goals for white students. The achievement gap is a very real problem. It can go on to impact all sorts of other things: graduation rates, college, income levels, etc. If we want to break the racial disparity in the United States, we must address the achievement gap. What’s it Look Like Locally? Cherokee Heights is the elementary school for the West Side. Nearly all of their scores are below 50%. Only 27% of their students are “on track” for success. 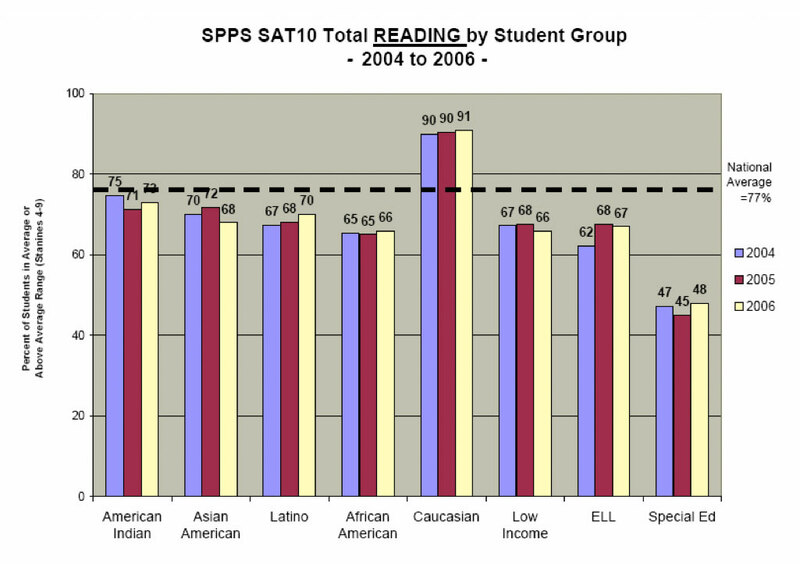 Students have not made a year’s progress (AYP) in reading for the last five years (2009-2013). The racial breakdown for Cherokee Heights is also incredibly diverse: 88% people of color. By comparison, Garlough and Somerset are both schools in the nearby West St. Paul district. Garlough’s scores are in the 50-75% range and Somerset is in the 75-100% range. Garlough has 68% of their students “on track” for success and has made AYP for all but two of the last five years in reading. Somerset has 71% of their students “on track,” and has hit AYP all five years. Demographics wise it should be no surprise: Garlough is 60% people of color; Somerset is 20%. I don’t say any of this to throw Cherokee Heights under the bus. They’ve got hard working teachers doing their best. But they’ve got a long way to go. Now I’m also not an expert on the achievement gap. But my wife is a kindergarten teacher. She knows this stuff. She works at a new charter school in the West Side neighborhood of St. Paul called West Side Summit. Charter schools are public schools with a specific focus, and are effectively their own district. West Side Summit’s goal is to close the achievement gap. They’re working with the same population as Cherokee Heights (West Side’s population breakdown is slanted more Hispanic and less black and Asian, but it’s very similar: 84% people of color). They’re using a new blended learning model—the only elementary school in Minnesota doing it—where the kids work on computers for large chunks of the day, using programs that adapt to what each kid needs to learn. They also have an extended school day and an extended school year—more time in the classroom. And they’re doing it. In the school’s first year the entire school averaged a year and a quarter’s progress in reading (West Side doesn’t have data in the Minnesota Report Card site yet; my data comes directly from the school). That may not sound like much, but most schools aren’t hitting AYP at all, let alone going above and beyond. Both the Minneapolis and St. Paul districts as a whole haven’t hit AYP at all for the last five years in reading. Even the West St. Paul district (with the highly achieving Somerset school above) has only hit it in 2013. So aside from depressing you about the state of our schools (remember: Minnesota is among the best in the nation), what’s the point? Giving kids access to books has been hugely important. A previous Donor’s Choose project put a ton of audio books in my wife’s classroom. Last year her class had a year and a half’s progress in reading. That’s amazing! Right now my wife is doing a Donor’s Choose project to put iPods in her classroom. The iPods will be a big improvement over CD players—no more scratched discs, no more dying batteries, plus kids can record and listen to themselves reading. It’s an innovative way to get kids into books, boost their reading and close that achievement gap. The project total is nearly $1,500. That’s a lot of money. However, the Bill & Malinda Gates Foundation is offering a 50% match if the project can be completed before Sunday, August 24. That’s tomorrow. So we need your help now! As I’m writing this, we only need $450 more to hit the goal and get the matching grant. Will you help? Please donate now. I realize this is only one tiny way to help close the achievement gap. It’s a giant problem with far-reaching consequences and there are probably a million things we could be doing. But that’s overwhelming. This is one way you can help right now. Update: The project was fully funded on Sunday, August 24. We did it before the deadline and got the fully matching grant. A big thank you to those who donated.